Clients want ethical advisors. Are you one? Steven Blum, author of 'Negotiating Your Investments,' spells out the kind of advisor investors should be looking for. 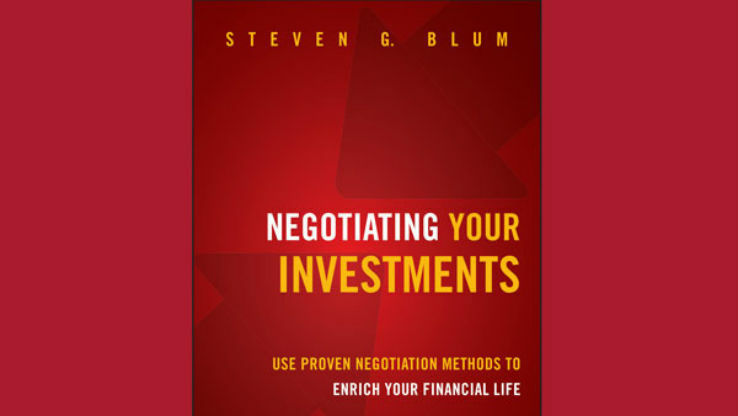 Steven Blum's book "Negotiating Your Investments." Ethics is often seen as skimming off a layer or two of the profitability of a business enterprise. But that’s merely a short-term view, says Steven Blum, an attorney and veteran instructor at the Wharton School’s department of legal studies and business ethics. In the long run, Blum contends, adhering to the highest ethical standards confers a unique business advantage on financial advisors because it impels them to conduct their affairs with a discernibly different level of professionalism. This allows financial advisors to stand out from the competition and foster a deeper level of client trust, which in turn strengthens both retention of satisfied clients and conviction-based referrals of their friends and associates. Blum’s new book, Negotiating Your Investments, coaches consumers in how to determine what constitutes a good financial outcome and then helps them achieve it, which is what Blum, a tax attorney, seeks to do for his clients across the gamut of financial issues they face. The flip side of the high standards he advises consumers to seek in the financial professionals they engage is his advice to advisors on what they need to do to meet these standards. ThinkAdvisor spoke with Blum about his views of an advisor’s professional responsibilities. Hint: Acting as mere fiduciary is inadequate in Blum’s book. Your book stresses the importance of expertise. What should an advisor’s professional qualifications be? The truth is that almost anybody in America can call themselves a financial advisor. There’s not a lot of regulation of that. People who call themselves financial advisors come in many different stripes. If you’re a financial advisor with a background in finance and economics, you ought to be telling people that. If you have solid degrees from important universities, for example if you have a Ph.D. in economics, you ought to be emphasizing that. I’m not saying you can’t be an advisor without that, but it’s harder if you don’t have expertise in markets and finance. [Absent a high level of academic grounding], from a consumer point of view, you don’t want that kind of advisor. Economics, investment, finance are broad areas. What area of knowledge stands out as vital to be an effective advisor? It is my strong belief that tax savvy around investments is equally important to investment savvy around investments. Both are important ways to put money in client pockets. And you need to do more than be tax savvy, you need to show it. Advisors say “I do tax planning around investments,” and they do it around products. But many of those products are priced so that a great deal of the tax benefit is captured by the product provider rather than the client. Different investments are taxed differently; different piles of your client’s money are taxed differently. And those two facts should be heavily coordinated. Highly taxed stuff should be in tax-deferred areas; lightly taxed stuff should be in the taxable [accounts]— to the extent that that coordinates with everything else, obviously. Apart from content knowledge, you advise consumers to seek advisors who are ethical. Do you mean advisors who are fiduciaries? Frankly I am an advocate for something higher than fiduciary duty. The definition that I advocate for is what I call professionalism. That means that when the client’s interests diverges from the professional’s interests, the professional follows the client’s interests and only the client’s interests. That’s a higher standard than fiduciary duty, but it’s close. It’s something that a good financial planner wants to tell clients; if possible a financial advisor wants to show or prove it. Couldn’t the advisor’s telling his clients about his ethical standards be mere rhetoric? When someone comes to me with a variable annuity inside a retirement account, I know they worked with somebody with a low duty to them. No matter what came out of the advisor’s mouth, I know how they were treating their duty to them. So how does an advisor demonstrate the kind of ethical professionalism you’re talking about? Tell clients honestly all the ways you make money, all your streams of revenue. And if only way is the money you get paid directly, you should brag about that. If there are any other sources of revenue that are less transparent, you should explain that to them honestly. If an advisor does have more opaque streams of revenue, then it is incumbent on the advisor to tell you all the things I do to actually minimize that conflict of interest so it doesn’t hurt you. But it’s more than just that. You also need to be open about how you make money for your company. Let’s say you’re a wirehouse guy, the question then becomes how I make money for myself and how my company makes money. Bad practices is sweeping it all under the rug and hope nobody notices. Good practices is not sweeping it under the rug at all and explaining it. Does disclosure of how the advisor and his broker-dealer make money take care of the conflicts of interest issue? No. There are financial conflicts of interest, but there is also a potential conflict of interest over time [if the advisor] pursues new business at the expense of current clients. The financial advisors has an absolute obligation to spend all the time necessary to get the job done and can’t let other commitments impinge on that. A true professional exercises strong professional judgment to do that, and a salesman doesn’t do that at all. A salesman’s job is to make sales. To some degree, that’s the great tension in this industry: How much of each are you? [Consumers] want it to be 90 percent professional and 10 percent sales, but a lot of people are 98 percent sales and 2 percent professional. If we could siphon off 20 percent of the greed from the industry, then advisors could do a significantly better job of seeing to all the legitimate needs of their current clients. Can advisors be completely conflict-free? You have a duty to absolutely drive out conflicts of interest. It is impossible to do the best possible job for your client if your mind is split by conflicts of interest. It’s impossible not to have any, but your job is to try to drive out as much as you can. To the extent that you can’t, I think the next key is to be open about them. We live in this universe of disclosure. There are two kinds of disclosure. The first kind is you hand the client a thick contract and you talk about it. That’s different from just handing over a thick contract for the client’s signature and the disclosure is buried somewhere on page 61. Anything else an advisor needs to know? You really need to understand economics, and one of the things that economists know is the efficient market hypothesis. And if you don’t understand it, you’ve got no business being a financial advisor. I often cite [efficient markets theorist] Eugene Fama. Well it’s not just me who says [you can’t beat the market], it’s [also] the Nobel Prize committee [which conferred the Nobel Prize in economics on Fama this year]. You can’t make promises to clients based on random chance any more than you can’t take client money with you to Vegas. If you say you can beat the market, you’re either ignorant or lying. Expertise and ethics — are they consistent with business success? In the long run, clients are going to be drawn to advisors who behave as true professionals, and it is my opinion that they will be more successful in their practice in the end. An increase in professionalism and doing what is best for the clients will over the long term result in better, more successful and more fulfilling practices for financial advisors.